Living in England has its benefits, one of which is the apparent lack of wildlife that wants to kill you, drag out outside and slowly digest your body in some dark corner of the garden. I say apparent, because there is an insidious threat lurking in every house, shed, woodland and allotment. The creepy-crawlies and bugs are out to get us. Take the spider as my first example. 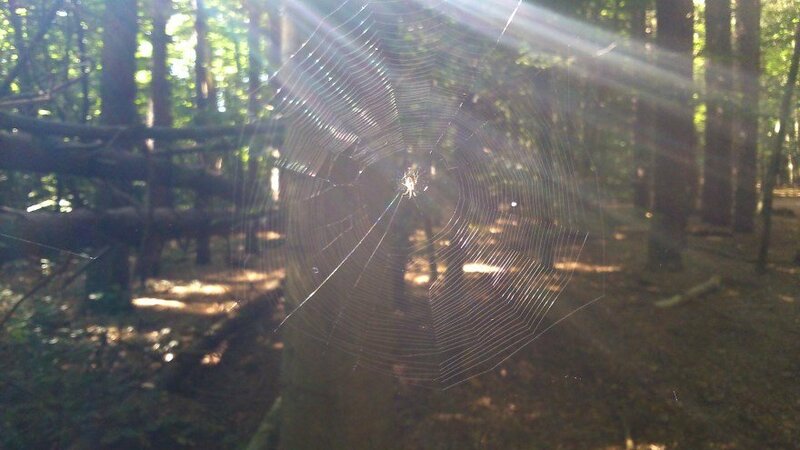 How many times have you strolled between two objects and felt a strand of web wrap itself across your face? Some think these are just passive support structures for a web not yet finished but these people are so very wrong. Every silken strand across your face is a failed attempt by a spider to garrotte you. 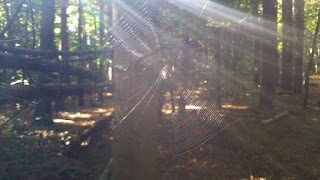 Don’t be fooled by the full web nearby, its occupant watching and trying to steer you into the trap. Turn and walk away. One day they will perfect the consistency of the strands, getting them upto a lethal specification for removing heads from necks. These strands seem at their most abundant during the morning, so I would make sure you don’t leave the house until at least midday. No matter how sceptical you might be, carry on dear reader, the information here just might save your life. My next warning concerns the humble snail, the proverbial slow coach that leaves a glistening trail like a slippery kiss wherever it goes. This trail is placed in the hope that it will make you slip and break your neck. Snails occasionally team up with slugs in this endeavour but there is a strange class system at work whenever they meet and commune, loosely based around housing permits and residency rights. Don’t be fooled though, if you see a snail and a slug together, they’ve put their differences aside to bring about your downfall. Now we move onto bees, and their often allies, wasps. These insects are adjusting their own humming, fine-tuning it as we speak to interfere with our Wi-Fi signals. Everyone knows that Internet speed into the countryside is usually a joke. This isn’t just down to slow infrastructure and distance, the hives of these creatures are like our Wi-Fi Extenders but in reverse, crippling phone technology with the mighty humming they produce. Moving to the city might be advisable to avoid this threat, although the mobile networks are likely to become a target too at some point. An even more baffling scheme now, and this concerns the humble woodlouse, the armadillo of the insect world. For some time now, woodlice have been rolling themselves into little balls and slowly replacing the cavity wall insulation of buildings. To what end I have no idea, I guess that we can only shrug our shoulders and stay vigilant for any sound of mobilisation. This is only a brief look at the dangers that scurry, buzz and slither around us, but I can’t wrap it up without mentioning the fly. A fly is mainly thought of as being a pathogen spreader and general nuisance, but its real aim is psychological warfare. This takes the form of buzzing around a sleeper’s bedroom at night, tickling their face, and generally doing anything to keep them awake. This is such a common occurrence, nothing is thought of it, but sleep deprivation can cause all manner of issues, from low concentration to paranoia. Sleep with windows closed, even in summer! I will end this post here as I feel I’ve given enough warning about the perils that litter the ground ahead. I apologise for any spelling mistakes or garbled words, I haven’t been sleeping lately. Take care and stay sharp. If you've enjoyed this post, that's fantastic. If wouldn't mind, please give it a like or a share on whichever social media you arrived from. Thank you very much and have a great day.